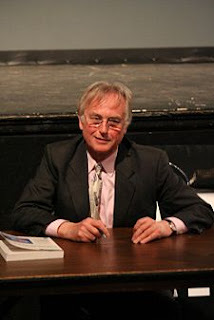 There is no double standard in Dawkins case, he says that he believes in Darwinian natural selection because he has sufficient proof for it--natural selection is easily observable in fruit flea populations in labs, for example. Believing in a deity is not based on evidence, there are no observations or proofs that a deity exists. The problem is he is talking about Darwinian evolution creating the appearance of 'design' as something he believes without proof. He is not talking about not believing in natural selection. If he hadn't seen proof for natural selection then he wouldn't be a very good scientist would he? Lol - the above is not me btw. PS - I'll get to this in full when I have time. Nonetheless, isn't it now hypocritical of you to criticise belief in something of which you have no evidence? In any event, as you may be aware, the scientific mind does not conclude in absolute truths. Thus, although there is significant evidence (I know you will argue about this) he cannot be certain, after all, knowledge is imperfect because it is generally subject to an infinite egress of further questions. Thus, he believes in evolution because of the high probability of it being correct. On this note, your headline is somewhat misleading. But apply the scientific method to your own beliefs. 1. Faith requires statements of absolutes - which a scientist will not accept. 2. Are the faithful sufficiently humble to admit that they may be wrong - as a scientist does? On the other hand, Dawkins is well-known for making faux pais. Thats what happens when you send a scientist to do a lawyers job ;). ...yet Dr. Dawkins admitted in an interview, that he does not have any evidence for evolution. The question asked for something he accepts without being about to prove. What definition is applied here? The idea of legal "prove"? It is possible to have evidence for something without being able to prove it conclusively (OJ Simpson, anyone? Lol!). No one can conclusively prove that god/s exist - if they could, this argument would be futile. You may claim to have some evidence that points to the existence of god, but that does not allow you to claim that you can "prove it". Dawkins did not "admit to having no evidence", he merely admitted that he cannot conclusively prove it occurred this way. I should have thought you would applaud him for being open-minded enough to consider another possibility?